The Kyudojo is close to Paris Paris and accessible by car via the A4 or A104 motorways, or by public transport by the A line of the RER. It is situated within the Bernard Légier complex, next to the Noisiel tennis club, adjoining the back (South) of the Ferme du Buisson. The access is through the Square du Verger (a small park). 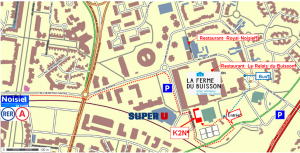 The closest adress to the Kyudojo known by the GPS systems or GoogleMap, is « 6 allée buissonnière – 77186 Noisiel » which actually points to the adjoining parking lot of the SuperU (supermarket). The Ferme du Buisson is also a well-known landmark of the area. Take RER line A, going to Marne-la-Vallée-Chessy, stop in « Noisiel – Le Luzard » station (about 30mn from « Châtelet – Les Halles » station) ; Note that the Paris métro « t » ticket does not take you there : you need a special ticket for that destination, or a zone 5 pass. (continue by foot) Coming from Paris, exit at the head of the train, turn right on allée Jean-Paul Sartre which runs along the RER line (for 150m), then cross the round-about and continue straight on Cours du Buisson (for 300m) until you reach Ferme du Buisson (a large ancient brick building). Arrived on the corner of the Ferme, turn right along the wall of the Ferme keeping the parking area on your right. Continue on the pedestrain allee (Allée Buissonnière) that turns around the corner of the Ferme (then you can see the Kyudojo and Matoba), walk along the fence towards the train line (towards the South), turn left at the corner of the fence until you reach a small park (le Square du Verger) turn left again and enter through the small pedestrian gate (total distance ~ 950m). (by Bus) Exit the station through the main exit, board on bus 211, and get down after about 4mn at the second stop (Le Verger). Bus is running from 6:00 à 21:00, every 30mn on weekdays, every 40mn on Saturdays, No bus on Sundays. From the bus stop walk untill the round-about, turn right towards the small park (le Square du Verger), cross the park and enter through the gate in the fence. From Paris (Port de Bercy) take the A4 motorway, bound for REIMS, METZ, NANCY. After about 17km leave the A4 and take the exit for [Val Maubuée Centre / Noisiel – Torcy] – could be pretty jammed at peak-hours. Then continue on direction [Noisiel –le Luzard / Lognes], and turn right at the STOP sign. Turn left at the first roundabout (bd de la Malvoisine), and left again at the second roundabout. The access to the Kyudojo is shared with the Complexe de Tennis Bernard Légier, a few meters before reaching the third roundabout. Several options are available for parking : see map. There two options for parking your car nearby. Beware : the public parking ends at the rear corner of the brick builing (Ferme du Buisson). Beyond that point that is the parking of the SuperU (supermarket), that may be closed by a gate every evening from 8PM or 9PM, and on Sundays from 1PM. 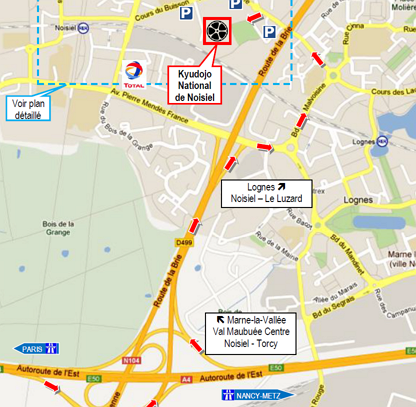 The other parking lot is East of the Kyudojo, beyond the SPS (Salle Polyvalente et Sportive), see map. Walk until the end of the parking, get down on the right to the pedestrain allee, cross towards the small park (Square du Verger) en enter the fenced complex Bernard Légier through the small gate. There are three options within a distance of 500m. SuperU, a large super-market where you can by all sort of food-stuff : open everyday 9:00 – 20:00, Sundays 9:00 – 13:00.